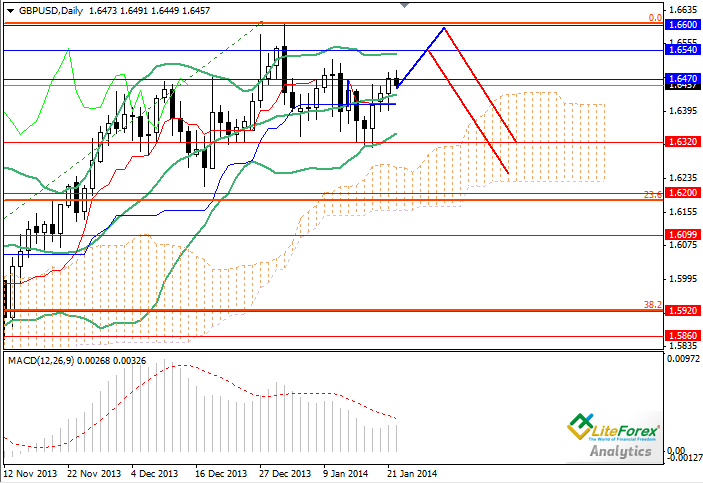 On Tuesday the pair GB/USD traded with low volatility because of lack of important economic news. In the morning high demand for the American currency caused the decline in the pair to 1.6400. However, in the afternoon situation has changed due International Monetary Fund prediction that British economic growth will amount to 2.2%-2.4% in 2014. This forecast had supported the Pound and the pair went up. Today’s attention will be focused on the British labour market. It is expected that unemployment rate and number of claims for unemployment benefits will reduce. Positive labour market statistics will support strong Pound and the pair can go to the key resistance levels of 1.6540 and 1.6600. However, medium-term outlook has not changed: the pair is expected to decline to 1.6100. Support levels: 1.6320, 1.6200, 1.6100 and 1.5920. Resistance levels: 1.6470, 1.6540 and 1.6600. It is advisable to place pending sell orders at 1.6540-1.6600, in view of upward correction, and with profit taking at the level of 1.6100.